Geraldine in a Bottle: Where are you on that career ladder? 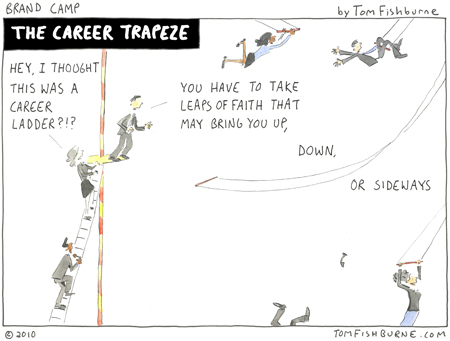 There is no career ladder for freelance artists. Don't search for one. Here is why. A Higher Position? As artists we work a thousand jobs at a time, some long terms, some short term. You may get to a higher position at one of your jobs (manager of the school of music you teach at), while staying at the same position at the others. Also, many jobs simply do not have anywhere higher for you to go. If you're the concertmaster at your local orchestra, or the conductor of a choir, you're pretty much already there unless you move on to a better orchestra or a better choir. More respect from your peers? Most people get respect from working with the same people for years, and from their results proving their worth over time. As gigging musicians, we constantly work with different people, which means that you may be respected somewhere and not somewhere else. More money? Hahaha, who are we kidding here? Fact is, it's not that we don't make money, it's just that we make very different money depending on the gig. So in one single day, you can go from teaching one hour in the morning at $40, to an afternoon three-hour orchestra call for $90, to a cocktail gig at night for $130 an hour. How much you get paid isn't connected to your value. 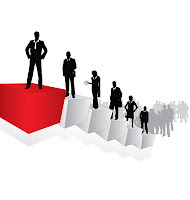 Knowing that you can't count on a career ladder for your career moves means a few things for you. Do not take a job that is not what you want, hoping that it will lead to the job you do want. For example, do not work front-of-house hoping it will lead you to an actor gig at the same company. Do not turn down a $40 gig because the one you got yesterday paid you $70. Gigs just don't pay the same. Well...I know what you mean, but I've definitely seen a ladder in my career. My gigs have progressively improved over the years. When I was a kid I'd get paid $20 a show, now it's $250 a show on Broadway. I think I've always looked for ladders to climb inside our industry. There aren't many, but I feel like they are there.